A second grader in York, Pennsylvania came up with an idea last year after his father showed him a photo of a bench placed by a German school on their playground specifically so that lonely or shy children could be offered friendship. Christian Buck wanted to put such a bench at his school, Roundtown Elementary, and the principal agreed. In the year since that one bench was put outside to foster relationship-building, others like it have popped up at schools across the country. More than 200 schools around the world have since installed ‘Buddy Benches’ — both across the United States, and in Australia, New Zealand, Japan, India, Italy and Canada, according to Christian’s family, which has kept track of the growth, says the York Daily Record, which first reported the story in December and followed up six months later. 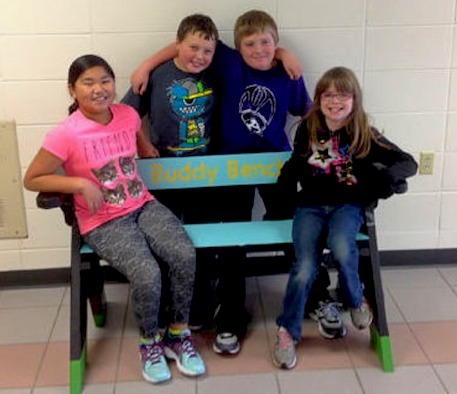 This week, the latest pair of ‘Buddy Benches’ were dedicated outside two schools in Ashland, Wisconsin for children to sit on as a signal that they would like someone to play with or talk to. The benches were funded by the Parent-Teacher Organization as a tool to teach kindness after counselors realized it would be great “for several kids who feel like they don’t have friends,” reported The Daily Press. The students have “greeted the idea with enthusiasm” after being taught that the benches are a way for kids to reach out to their lonelier peers. “It really builds their self-esteem to ask others to play with them,” said Intermediate School Counselor Kelly Sundeen. Resources are now online to help schools personalize their own kindness corner. 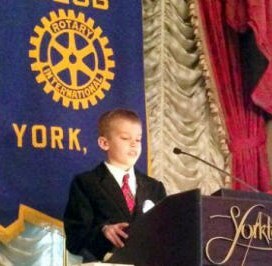 The simple idea has certainly made a difference in the life of Christian Buck, who has traveled to California and Connecticut to speak in front of groups about his inspiring project — while still only eight years old.